Free Workouts from SportSkool: For When You Can’t Leave the House. No Excuses! As I write this, I’m onto day 5 of nursing my 9 year old, who is home sick with the flu. (I posted earlier this week if you’re in the same boat as me and want to see how I’m nursing him – What You Need to Help Your Kids Get Through the Flu.) I didn’t want my fitness routine to suffer and I had hubby around over the weekend so I could scoot out to get a couple of workouts in. But Tuesday it was back to work and our regularly scheduled program, with the exception of sick kiddo on the couch, which means I can’t leave the house. I dressed for a workout and decided to check out what was available OnDemand with my cable provider (Verizon Fios). I have previously resorted to doing workout videos at home this way, because sometimes you simply just can’t get out the door. But modern technology means we have no excuses! There’s always a way to find a workout at home via some form of technology – be it Netflix, your cable provider or something else that you can stream online. My favorite video? 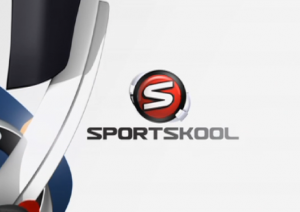 This series of videos from Sportsskool that I can get On Demand. This video here is my absolute favorite – it’s a 43 minute Kickboxing workout and it’s a WORK OUT. I definitely sweat well and feel like I’m getting a decent workout with it – and better yet, no extra props required! You just need yourself and some good workout duds. Home with a sick kid today too, and can’t fathom doing the elliptical again, so I think I’ll give this a try, thanks!!! If you do it, let me know what you think! I’m totally into the Kickboxing ones with the Spanish guy… it wouldn’t embed the vid here for some reason. But he is awesome! Whitney, thanks! I couldn’t have said it better myself! I work at Sportskool and you’re right – nothing beats work-outs on YOUR schedule. And Sportskool makes it easy, fun and never boring! There’s something for everybody and every BODY! In addition to Guillermo Gomez’s Kickboxing, you can choose from sessions as short as 10 minutes with the terrific Jessica Smith. This month, we’ve got ballet-inspired workouts with Jennifer Galardi, high-energy dance workouts, Pilates, yoga, cardio, walking and some fun fusion sessions like Grace and Gusto that’s a blend of Pilates and ballet. And later in February we’ve got an all-new CARDIO ABS workout with Jessica Smith. Tell us what you think and what you’d like to see on Sportskool – either here or find us on Facebook!